Ribble Pro Cycling are delighted to announce their latest partnership with Intack Self Drive. Intack Self Drive is one of the largest privately owned self drive rental companies in Lancashire and indeed the North West of England. With the team facing a variety of logistical challenges throughout the season, not least the upcoming Tour de Yorkshire, Intack Self Drive’s over 150 years combined experience in vehicle rental will be invaluable for the team. The team has chosen to utilise a Volkswagen Transporter Kombi and 2 Hyundai i40 estate cars. The flexible nature of Intack Self Drive means that the team were able to exactly spec their requirements and be provided with an ideal solution. With the added capability of a van in addition to spacious estate cars, the team will be sure to be travelling in style regardless of event. Added capacity will also allow us to ensure our riders perform at their best by providing a travelling mechanical workshop. Look out for the team vehicles across the country and on the television in this years Tour de Yorkshire and make sure to check out Intack Self Drive for all your vehicle requirements. Be it daily hire, flexi hire or contract hire Intack Self Drive has it covered. With a fleet of over 350 vehicles and the promise not to be beaten on price, you’re sure to be in good hands! For Round 2 in the KISS Super League on Zwift Team Ribble headed to Innsbruck for four laps of the Innsbruckring route. Zwift, a virtual platform allowing competitors across the world to compete from their own home trainer, has revolutionised esports through their new KISS Super League. In the league, elite riders, including Team Ribble compete on a series of virtual circuits that provide a challenge to every rider. So Ed, talk us through what triggered the attack? Ed: To be honest, it was just one of those things! The pace seemed to ease slightly for a second and I thought well it’s been hard but I’m still feeling good! Maybe if I go now I’ll get a gap. And you never worried about holding it to the line? Ed: Haha I don’t think I was thinking anything really, it was just hurting too much! I knew however that I could do the power and I had a few handy PowerUps still stored so I knew I’d be able to use them to get the most out of my effort. You mention the PowerUps, what are these? Ed: Well there are a couple of different ones, but what was key on this flat circuit was the Aero Boost. Basically it’s like the difference of swapping onto a TT bike for a few seconds! It’s great to see your speed instantly go up, but at the end of the day you have to keep pedalling. Any other little tricks out there? Ed: I think the biggest trick was probably doing it in my friend’s garage. Cold and a bit of a draft, it sounds terrible but it’s actually the perfect setup to make sure you’re not overheating and can give your max. Having him there as well to cheer me along too was a great help. I also train a lot on Zwift over the winter as I like how you can structure your efforts but not get bored. And looking to the future, any more wins out there? Ed: Well I think I need to recover from this first! But I wouldn’t rule it out on a flat circuit. We’ve a few interesting team tactics as well potentially to keep the other teams on their toes. Thanks Ed and make sure you tune in next Wednesday evening on Zwift’s YouTube and Facebook feeds to see how Team Ribble gets on in the next round! 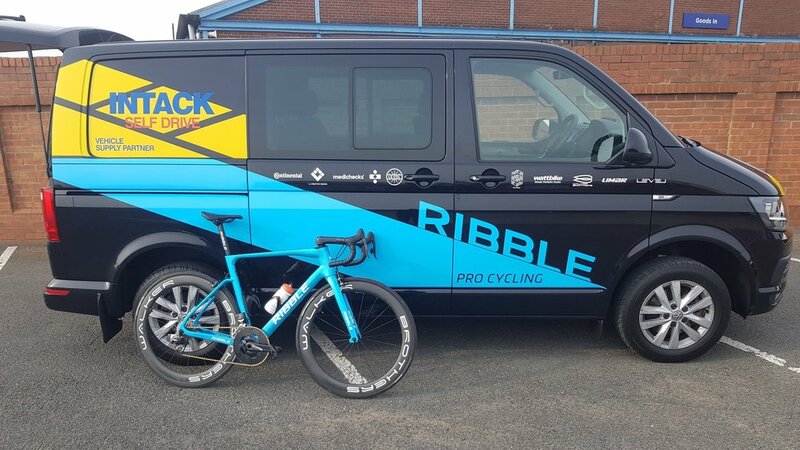 Jake Gray completes the Ribble Pro Cycling team ahead of the 2019 season. Jake, a former Irish National Junior champion, spent 2018 competing for French Elite National team VC Toucy alongside the Irish National team. Through 2019 Jake will balance a UK and European program with Ribble Pro Cycling alongside representing Ireland at a number of prestigious U23 Nations Cup events. Ribble Pro Cycling have continued to develop year on year and built a sustainable platform for success and progression. The team are competing at a UCI continental level in 2019. Ribble Pro Cycling continue to put their final preparations together ahead of next season ahead of a successful 2018 campaign that included over 100 victories. Ribble Pro Cycling to use Limar in 2019. Limar are an italian company, with over 30 years experience in the production of cycle helmets, leading the way with the world’s lightest helmet range. Limar has a strong mission: to be “The Helmet Specialist” by offering the market the widest and best range of helmets in terms of lightness, aerodynamics, comfort and fitting. At the start of 2018 Limar launched the new aero Air Revolution range of helmets which is a collaboration with the Astana Pro Cycling Team. Extensive computer R&D along with wind tunnel testing at the F1 facility at Magny Cours in France has resulted in a range of helmets specialising in extremely low drag coefficient aerodynamic performance. The team will use the Air Speed model which wind tunnel testing revealed better numbers than some full time trial helmets. Ribble Pro Cycling have continued to develop year on year and built a sustainable platform for success and progression. The team are competing at a UCI continental level in 2019. Ribble Pro Cycling continue to put their final preparations together ahead of next season ahead of a successful 2018 campaign that included over a 100 victories.